Please join us for our one day Ukrainian Food Festival where you will find delicious Ukrainian food, sweets, and Other Ukrainian refreshments. All prices are reduced to give everyone an opportunity to taste the best of Ukrainian kitchen. Thank you for making our 15th Washington Ukrainian Festival our best one yet. We welcomed over 12,000 people, we offered the best entertainment, food, drinks, activities for children and about 30 vendors. Here are few pictures and more to come. 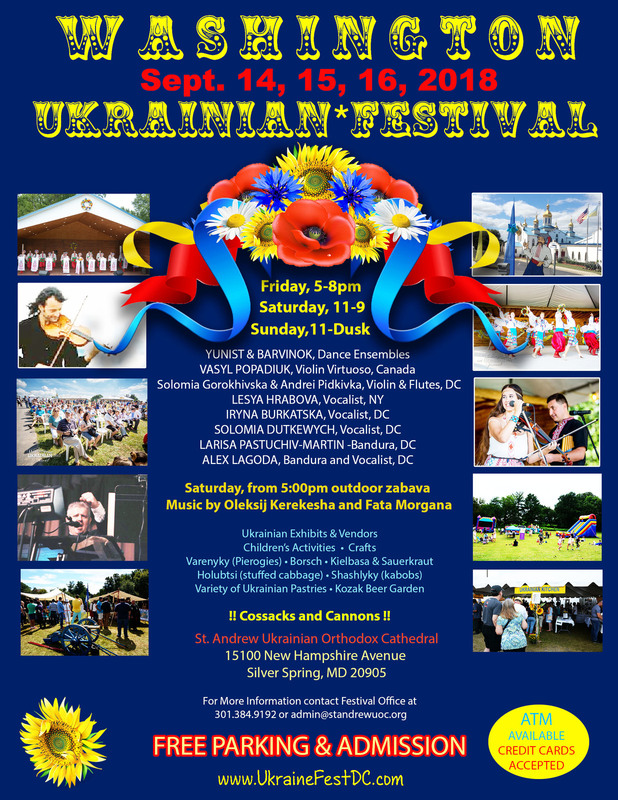 The Washington Ukrainian Festival was established in 2002 at the initiative of St. Andrew Ukrainian OrthodoxCathedral. 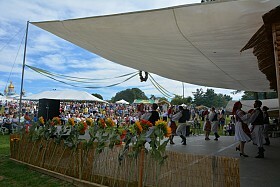 The festival became a riveting success from its very beginning, with throngs of visitors enjoying unusual foods, arts and crafts, and entertainment on the inviting Cathedral grounds. In a setting of more than six acres and apastoral pond under the shade of the golden domes of the beautiful Cathedral, visitors to the festival are immersed inthe beautiful and authentic Ukrainian mosaic. From the Cathedral to the Cultural Center to the grounds and the permanent outdoor stage featuring Ukrainian entertainment, to the food tents and vendors’ village, to the Kozak beer garden and grill, to unforgettable Ukrainian tortes and sweets, to the Ukrainian deli and an abundance of children’streats and activities, the Washington Ukrainian Festival is so unique that it rightly attracts many thousands of visitorsevery year. The festival is such an unusual, joyous event that the second weekend in September is now permanently calendared byvisitors far and wide as a special day of Ukrainian celebration at the perimeter of our nation’s capital. We look forward with pleasure to seeing you September 14, 15-16, 2018! Andrew shot somegreat pics. Check them out!